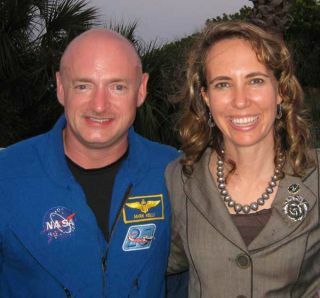 CAPE CANAVERAL, Fla. — The months of rehabilitation paid off for wounded Congresswoman Gabrielle Giffords today (May 16) as she watched her astronaut husband launch into space on NASA's space shuttle Endeavour. Giffords, D-Ariz., was surrounded by her mother, her stepchildren, her staff, and the other astronauts' family members as her husband Mark Kelly commanded the shuttle Endeavour's final liftoff to orbit from here at NASA's Kennedy Space Center. The group watched the launch from the top of NASA's Launch Control Center. Giffords had two nurses with her to monitor her progress as she recovers from the bullet wound to the head she received in January during a community outreach event in Tucson, Ariz. She has reportedly made exceptional progress in rehabilitation so far. "She understands, if not everything, close to everything," Carusone said. "There's hardly a moment that we have that we feel like she's not quite grasping, to the point where she understands sarcastic humor. Her voice sounds very normal, it sounds as it did before the shooting." "There were hugs all around," Carusone recalled. "Cheering, clapping. I think relief was her biggest feeling. She was very proud, is always proud of Mark and what he does. Giffords will return soon to her rehabilitation hospital to get back to the hard work of recovery. "She's focused on her recovery," Carusone said. "She's a very determined person. Our hope is that she can return to her life both personally and professionally." Kelly is commanding Endeavour's 16-day mission to the International Space Station. The shuttle is carrying a $2 billion particle physics experiment and a supply of spare parts for the orbiting laboratory. Endeavour is also carrying a hidden note that Giffords handwrote for Kelly, Carusone said. In addition, Kelly took his wife's wedding ring to space with him, leaving his with her on the ground in return. The shuttle's veteran crew of six plans four busy spacewalks and a host of robotic arm activities to install the new units and perform maintenance on the station.